Our built in camera makes it possible to perform automatic focusing without the use of any external devices. This is possible even when targets may not be placed at the exact same focal length from the laser and eliminating the need for external tooling. Additional production costs can be kept to a minimum while increasing efficiency and throughput. *The built-in camera is used to monitor the focal distance using the laser pointer. 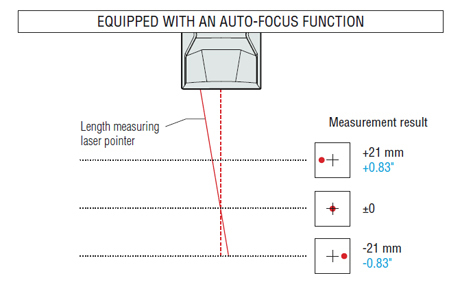 Automatic focusing is performed by calculating the focal distance from the pointer position. This measurement may not be possible in some cases due to the material, shape, and surface of the workplace. Contact us about your needs and we'll provide information on the right solution for you.